ProServ e1200P Premium Pedestal Server Chassis with Front Panel NIC, Status and Hard Drive LEDs. Hot-Pluggable Hard Drive cage for quick drive additions or replacements. • Supports both 32-bit and 64-bit Operating Systems such as FreeBSD, Linux Red Hat, Linux SuSE, Fedora Core. Microsoft Windows 2003 and 2008 R2 Server. 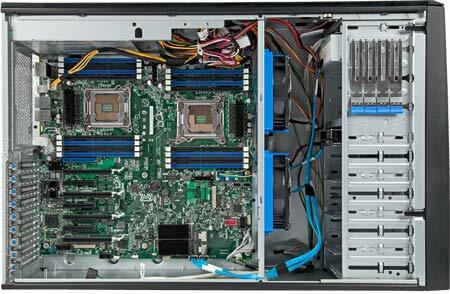 Processor Support: One or Two Intel E5-2600 Series Xeon Procesors up to 12-Cores/processor. • Up to 8 x 3.5-inch SATA Hard Drives (6GB/s) or 8 x 2.5-inch SSD, SAS or SATA (6GB/s) Drives . • Integrated Intel Rapid Storage Technology SATA controller based on LSI Software Stack with support for Software RAID-0, RAID-1, RAID-4 or RAID-10. • Optional Add-in Hardware RAID controller provides 6GB/s SAS or SATA + online Hot-spares. Memory: 16 Memory Dimm Slots support up to 512GB DDR3/1866Mhz E.C.C. REGISTERED CMT Certifed Memory. Cooling System: Five Hot-Swappable Redundant Cooling Fans. Headless Lights Out: Bios and OS Console Redirection support, PXE boot option, IPMI compliant Server Chassis and Server Board and Server Management Software included. Power: 2 x 700-Watt Platinum Level Efficiencty Redundant Hot-Pluggable 120-240 Volt P.F.C. Power Supplies. Remote Server Management: Integrated IPMI 2.0 baseboard management controller. Optional Web Based Remote Management Module with 10/100 dedicated NIC provides Redirected Console, KVM via Web Browser (Firefox, Internet Explorer, Opera) access to the integrated management controller. Servaris ProServ e1200P is a highly reliable, Pedestal Server optimized for maintream computing requirements. e1200P Tower Server is comprised of high-end Intel Server Board with Intel designed Pedestal Chassis. Supports 1 or 2 Intel E5-2600 Series Xeon Processors. The Intel Server Board supports up to 512GB DDR3/1600 Mhz. CMT Certified Memory. With 8 Hot-Pluggable Drive Bays, storage for data is highly available. This is ideal for a Virtualization Server. With support for many operating systems on a single Server cost is reduced to a minimum enabling the highest return on investment without sacrificing Computing Performance. The ProServ e1200P Supports Microsoft Windows 2008 R2 and Windows 2012 Operating Systems. It's Open Source Operating System Ready and supports CentOS, FreeBSD, Fedora, Red Hat, SuSE, Ubuntu. Servaris e1200P is an excellent cost-effective solution for Virtualization and Storage Server Environments. Platform Virtualization: Next Generation Intel® Virtualization Technology enables best-in-class virtualization performance, superb scalability, enhanced flexibility, and simplified server management. Not sure if this server is right for you? Please feel free to call us toll-free. We're here to answer your questions.